Enter the reg number below and click "Get Report". You will be passed through to the Motorcheck.ie website where you can obtain a full report on the vehicle in an instant. The data displayed above includes the usual specification of the most recent model of this vehicle. It is not necessarily the exact data for the actual vehicle being offered for sale and data for older models may vary. Furthermore please be aware that a vehicles performance may deteriorate over time. We recommend that you always check the details with the seller prior to purchase. We do not give any warranty or representation, express or implied, about the accuracy, completeness, merchantability or appropriateness of any information, materials or graphics on this website. 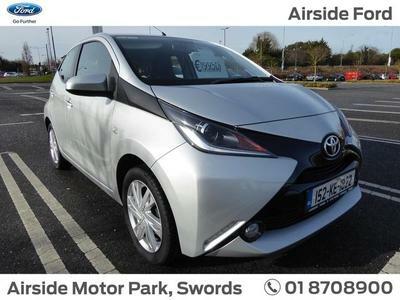 With its striking ‘X marks the spot’ design, you certainly won’t miss the new generation Aygo. Already an instant hit with the Irish market since its launch back in 2005, this tiny new breed of green city car makes perfect financial sense for city dwellers and suburbanites who needed a small, cheap runabout to get from A to B. While the dramatic new styling may turn heads, the changes to this new generation are not merely cosmetic. Toyota have managed to increase the MPG of the trusty 3 cylinder petrol engine, as well as eeking out an extra couple of centimetres in headroom, and increasing the boot size by 29 litres. All of this plus a fully customisable interior make the Aygo one of the most practical, yet playful super minis on the market at the moment. Design can make it easy to kerb the wheel trims. Be careful. The text and video reviews displayed are not of the actual vehicle being offered for sale. They are provided only for general information, they are not intended to address your particular requirements and do not constitute any form of advice or recommendation. Furthermore please be aware that a vehicle’s performance may deteriorate over time. We recommend that you always check the details with the seller prior to purchase. We do not give any warranty or representation, express or implied, about the accuracy, completeness, merchantability or appropriateness of any information, materials, videos or graphics on this website. We have sent details of this car ad to your friend's email address.